The state capital budget, passed by the Legislature earlier this year after a delay, allocated more than $11 million for the protection of shorelines in King County that are vital to the return of wild and endangered salmon. But as work to support their recovery moves forward on Maury Island, advocates say time is running out for the dwindling orca pods that have depended on these fish for generations. In January the Washington Salmon Recovery Board and Puget Sound Partnership announced an award of more than $53 million to environmental improvement projects statewide, made possible by funds from the capital budget. 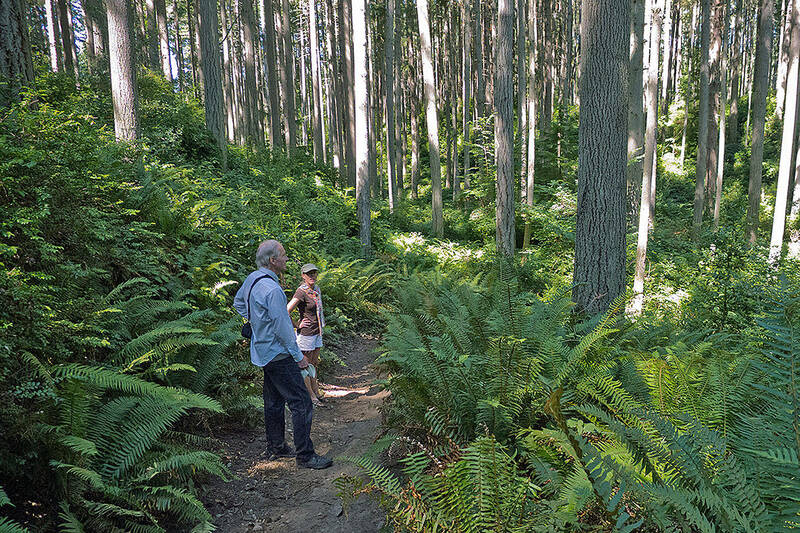 Using a grant of nearly $300,000, the King County Water and Land Resources Division will purchase 11 acres of shoreline bluff and nearby beach on Maury Island as part of the aquatic reserve there. The land acquisition is one phase of a larger, multi-million dollar effort to remove 700 feet of reserve bulkhead armoring from south central Puget Sound, enabling the return of an abundant habitat for eelgrass, forage fish and salmon. “Marine shoreline is a very important part of the salmon life cycle,” said Greg Rabourn, watershed steward of King County. A functional ecosystem must have certain components to support life, and according to Rabourn, these requirements include native vegetation, a robust population of herring and forage fish and sediment to replenish the beaches. Bulkheads, or shoreline armoring, prevent beach erosion but severely debilitate natural habitats. Removing the bulkheads restores the sediment supply, and new research has found encouraging evidence that major habitat rebounds are possible in as little as one year, according to a paper co-authored by islander Jeff Adams. The armoring removal and reserve protection work on Maury Island is expected to be completed in 2019. Even with plans in place, no one can be sure when the salmon may return. Some populations of Chinook salmon, such as those in Washington, are federally listed as endangered. The Land Trust has worked in conjunction with the Water and Land Resources Division in the past and coordinated when possible, although the island nonprofit is not a grant-funded partner. Together, Dean says that their bulkhead removal stands out as some of the most exciting and highest ranking restoration work in the region. But greater tests are still to come. “What happens now is because their food isn’t any longer available, Chinook have to rely more and more on food they find on marine shorelines like the ones on Vashon Island. When you remove a bulkhead on Vashon, that’s providing food for this species that is hurting the most in Puget Sound,” he said. As growth in the Seattle area contributes to congestion and development around Puget Sound flourishes, Dean worries that in the future there won’t be enough attention given to living in cooperation with nature. “People live on the waters because they love watching nature in front of them, so there can be a real disconnect with property owners with wanting to be a part of nature without wanting to be a part of the problem,” he said. In the interest of urgency, Dean praised Sen. Sharon Nelson (D – Maury Island) for her efforts in the Legislature to help get the capital budget passed in January. He thinks it will take further conversation about the restoration cause before habits meaningfully change, time that isn’t available for the sound’s orcas. “Our local orcas are the only kinds that eat fish. Their preferred food is Chinook, and they are literally starving to death,” said Dean. Joseph Bogaard, executive director of Save Our Wild Salmon, believes that no matter how small the first steps toward positive action may be, it is up to the public and to government to turn the deeply declining orca population around. In addition to dwindling salmon, other adversities that pose grave complications for orcas are interactions with vessels and the ingestion of toxins, but Bogaard says that food is their most vexing and critical challenge, exacerbating the other problems. “The southern residents need more food. And the food they prefer and have relied on for hundreds or thousands of years, maybe longer, are the Chinook salmon. It’s no surprise that this predator would be struggling given what we’ve allowed to occur,” he said. Despite this bleak outlook, Bogaard and his peers are closely watching a response from the Governor’s Office, which was expected on Monday to introduce an executive order designating time and money for the protection of the orcas. “We are greatly encouraged by this new focus and energy and commitment of resources to address the plight of the southern residents. But the devil is in the details. We look forward to seeing what the governor and his team are proposing,” Bogaard said.